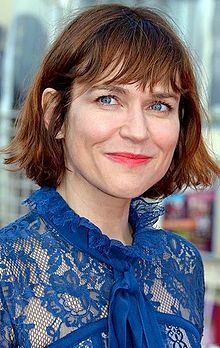 Marie-Josée Croze (French pronunciation: ​[maʁi ʒoze kʁoz]; born February 23, 1970) is a French Canadian actress. She also holds French citizenship, which she obtained in December 2012. Croze was born in Montreal, Quebec and grew up, adopted, in Longueuil, with four other children. She studied plastic arts at the Cégep du Vieux Montréal from 1986 to 1987. For her role in Denis Villeneuve's Maelström (2000), she received the award for Best Performance by an Actress in a Leading Role at the 21st Genie Awards. She won the award for Best Actress at the 2003 Cannes Film Festival for her performance in The Barbarian Invasions. She was cast by prominent Hollywood director Steven Spielberg for his film Munich which was released in December 2005. She also made a major appearance as a speech therapist in Julian Schnabel's 2007 film adaptation of Jean-Dominique Bauby's memoir The Diving Bell and the Butterfly. In November 2012 she was selected as a member of the main competition jury at the 2012 International Film Festival of Marrakech. ^ "Exclu vidéo : Marie-Josée Croze adoptée quand elle était enfant : "Je suis pour le mariage pour tous. L'important c'est d'être aimé par des gens qui prennent soin de vous"". Public.fr. Retrieved December 23, 2017. ^ "Festival de Cannes: The Barbarian Invasions". festival-cannes.com. Retrieved November 7, 2009. Wikimedia Commons has media related to Marie-Josée Croze.